When a boat carrying over 700 refugees capsized off the coast of Italy last April, it sent the Western world into shock. Only three days earlier, another ship from Libya with 400 refugee passengers sunk as well. By the end of 2015, nearly 3,000 refugees had died en route to Italy. This Central Mediterranean route (from Libya to Italy) has been a popular departure point for African refugees and migrants escaping the continent. It was also a destination for Syrians refugees before the Eastern Mediterranean (from Turkey to the European Union) became a more accessible and safer alternative. Of the 150,000 people crossing the Central Mediterranean in 2015, approximately 40,000 were from Eritrea alone. But unlike other nationalities on the same route, mainly Somalis and Sudanese, Eritreans aren’t leaving a warzone. So why are they braving dangerous waters to get to Europe? Why is Eritrea’s population fleeing? To answer that question, a little background in Eritrean politics is needed. Eritrea gained independence from Ethiopia in 1993 after a referendum unanimously passed in the formally annexed region, ending over 30 years of conflict between local separatists and the Ethiopian government. Although Ethiopia’s new government, formed from the Ethiopian People’s Revolutionary Democratic Front (EPRDF), initially supported the independence movement, the two countries soon began to argue over their border. This ultimately led to the Eritrean-Ethiopian War of 1998, which claimed an estimated 70,000 lives and hundreds of millions of dollars before a ceasefire in 2000. As a result, Eritrean economic development plummeted and a country with a once impressive 13 percent annual GDP growth rate began experiencing volatile economic changes. The war also left thousands of Eritreans internally displaced and trapped in a continuous border war with Ethiopia, where troops from both countries can still be found posted on either side. Since 2000, tensions between the two neighboring countries have only increased. In the last decade, Eritrea has found itself in the unfortunate spot of being oppositional to the only American ally in the region, Ethiopia, and thus subject to the wrong-end of U.S. influence. Leaked U.S. embassy cables from 2009 show that Meles Zenawi, the Prime Minister of Ethiopia at the time, was instrumental in the U.N. Security Council imposing economic sanctions on Eritrea, further diminishing its economic health. Perhaps most detrimental to Eritrea’s potential growth, aside from Ethiopian interference, is the fact that the country has been ruled by the same leader since independence. Referred to as an “unhinged dictator” by the former U.S. Ambassador to Eritrea, Isaias Afewerki has routinely come under fire by human rights groups for creating a repressive regime. Mandatory conscription was introduced following independence, which on its own would not be cause for concern considering many other countries, like Israel and South Korea, have similar laws. But while national service in Eritrea is only supposed to span 18 months, most citizens between 18 and 55 years of age have found themselves indefinitely trapped. 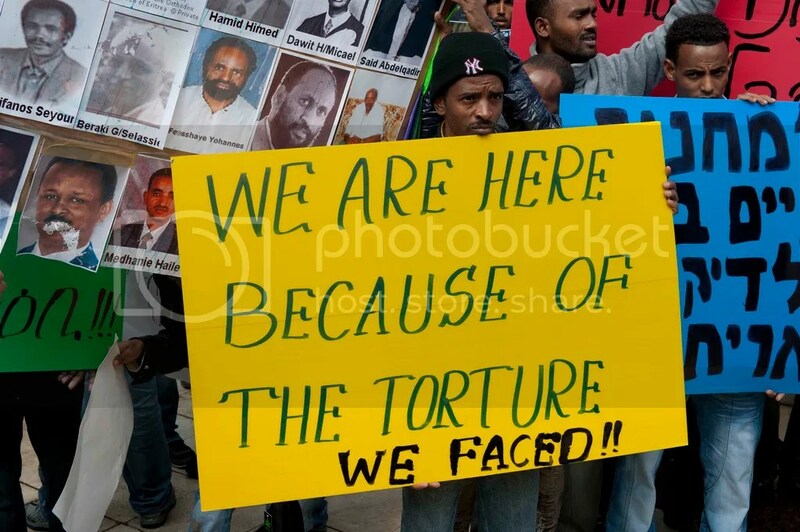 Eritrean rights activists refer to the country as an “open prison” because military personnel are often used for manual labor, such as mining for gold in the desert for less than $2 a day. Citizens also risk imprisonment and extra-judicial executions for simply voicing their opinions on the government, with over 10,000 political “dissidents” held in 300 prisons across the country. Journalists, in particular, face serious consequences for their reporting, as Eritrea is routinely cited as one of the most censored countries in the world. It is believed that less than 5.6 percent of the population has access to mobile phone and only 1 percent has an internet connection. Considering the current conditions of life in Eritrea, it is completely understandable why Eritrea’s population has tried its best to escape. But the journey is dangerous and, at a price of $5000 per passenger to cross the border to Sudan, also incredibly expensive. Sudan is beginning to feel the burden of Eritrean refugees who cannot afford to pay for passage onward to Europe, as the number of new arrivals per month rose to 1,000 in 2015. The few who manage to successfully leave the African continent face another obstacle: deportation. Eritrean refugees arriving in Israel are subject to imprisonment or forced on a one-way flight back to the continent, typically to Rwanda or Uganda. At some point over the last few years, Denmark, the United Kingdom, and Norway have all attempted to deny entry to Eritrean asylum seekers on the basis that the Eritrean government plans to end indefinite service, a claim that has yet to be confirmed. In an effort to stem a further influx of refugees, the European Union has offered aid to Eritrea; though there is no guarantee it will ever reach the general population. ← ZIKA OUTBREAK: WHAT IS IT, AND WHAT IT MEANS FOR THE U.S.